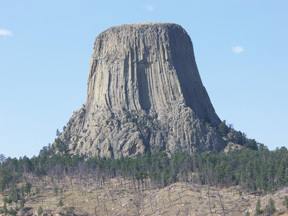 Made famous by the 1977 film classic, Close Encounters of the 3rd Kind, Devils Tower is the remnant of an ancient volcanic feature. It is a volcanic plug in which the columnar jointing of its fluted sides formed as the molten rock cooled, creating near-vertical walls. The mountain's columns are some of the highest (up to 600 feet) and widest (10-20 feet) of any mountain in the world. The summit sits at 5112 feet and is approximately 862 vertical feet from the national park service's elevation bench mark of 4250 feet situated near the visitor's center at the base of the mountain.